The world is losing species at a rate that is 100 to 1,000 times faster than the natural extinction rate. Mass extinctions of species have occurred five times earlier in the history of the world – the last time was 65 million years ago. Unfortunately, we are now witnessing the sixth mass extinction, which is a result of competition for resources between human and all the others, Professor Ranil De Silva said. According to Prof. De Silva, islands which often consist of a high proportion of endemic, in effect ‘limited-edition’, species have accounted for the bulk of the world’s recognised extinctions of species. Interestingly, recent surveys (IUCN 2017) indicated that there are 1,432 medicinal plant species in Sri Lanka, and out of them, 100 - 200 species are endangered. Therefore, a need has been raised in the island to rationally utilise medicinal plants for curative purposes with the proper maintenance of biodiversity. Prof. De Silva pointed out that the conservation of herbal medicinal plants, sustainability of the herbal drug industry and the authentication of medicinal plants were the most critical issues recognised in the last decade. The adulteration of medicinal plants may be intentional or non-intentional. Numerous approaches can be implemented to ensure plant-based material authentication for medicinal plants. Of the identified 1,432 species of medicinal plants in Sri Lanka, only a small percentage have been studied for their potential value as a source of medicinal drugs and among these drugs, some are unique and thus the genetic mapping of Sri Lankan medicinal plants could usher in the fourth industrial revolution. “Bitter gourd (Karavila) and salaretin (Kothalahimbutu) include naturally-occurring biochemical or genetic materials which are commercially-exploited especially by obtaining patents that restrict their future use, while failing to pay fair compensation to the community from which they originate. The real threat to traditional medical knowledge systems is not because of ‘theft’ or simple biopiracy, but because of the undermining of non-Western cultures and knowledge systems. Thus, the challenge is to protect Sri Lankan culture from being destroyed,” he said. “Biodiversity can be conserved by the sustainable use of its components and equitable sharing of the benefits arising from the commercialisation and other utilisations of plant genetic resources. This has inspired the research for ethnopharmacological values with the hope of giving rise to new drug leads or to the discovery of new bioactive compounds,” he said. “Despite the major suppliers of global herbal medication raising prices and health budgets being tightened in the developed world, consumers are still driven towards safer herbal medication. The driving forces of this exodus towards herbal medications are the increase of consumer awareness, the reduced risk of detrimental side effects, and the introduction of value-added raw material-based products to the market,” he said. “This increased demand for herbal medicinal products has been met with a negative response as there is insufficient research and standardisation in the field, as well as poor legal and regulatory frameworks, resulting in issues related to patents and the introduction of low-quality products to the market,” he said. He said Curcuma (Curcuma longa L.) or turmeric is not only a delicious spice in Asian cuisine, it has been also used for ages to treat wounds and rashes in India. A US patent of two Indian scientists on curcuma as a drug to treat wounds had been retracted. However, the Indian Council for Scientific and Industrial Research (CSIR) successfully sued the US Patent Office, because these medical effects of curcuma were mentioned in an ancient Sanskrit text, which was published in 1953, in the Journal of the Indian Medical Association (British Parliament, 1999). This is an unambiguous example of biopiracy. This also demonstrates the importance of written documentation for preventing the same. The decision to revoke the patent by the US Patent Office marks a turnaround in the legal framework in that it respects indigenous knowledge handed down in ancient texts. These texts, such as Hindu epics, which link medical knowledge to cultural and religious tradition, are themselves recognised as evidence of the ownership of medical knowledge by a given community. Nowadays, the discovery of genetic markers has been very useful to authenticate herbal medicinal plants with their conserved medicinal properties. Apart from the authentication of traded medicinal plants with these techniques which can be applied in biodiversity monitoring, conservation, impact assessment, monitoring of illegal trading and forensic botany. These authentication methods require knowledge concerning the plants to be identified in order to be able to based them on comparisons of molecular markers. Molecular marking affirms a sample’s identity or its dissimilarity with the species to which it is supposed to belong. Molecular markers are based on the differences in the genetic sequences existing between individuals and species. Nevertheless, databases comprising the patterns obtained for different species are often indispensable for fraud detection. In the future, the standardisation of herbal medicine will possibly play an important role for approval of complex herbal medicine as a treatment and require robust and rapid analytical methods to ensure the quality of these products is retained without the tedious preparation normally necessary for quality control on complex mixtures. Therefore, the quality control analysis will not be probably done on a few selected constituents, but will be done on the whole composition of the sample in the future. 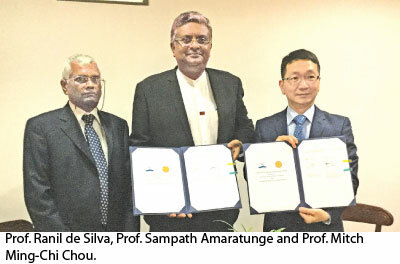 Therefore, the Sri Jayewardenepura University (USJP), with the collaboration of the National Sun Yat-sen University (NSYSU) is to start the genetic barcoding of herbal medicinal plants in Sri Lanka, to avoid biopiracy. Prof. Ranil de Silva as the Director of the World Class University Project (WCUP) and the Director of Interdisciplinary Center for Innovation in Biotechnology and Neuroscience (ICIBN) is the driving force behind the long-lasting collaborations with NSYSU and was instrumental in the signing of two Memorandum of Understandings (MoUs) on March 14 and November 16, 2018, respectively by USJP Vice Chancellor Prof. Sampath Amarathunga and Prof. Mitch Ming-Chi Chou, Vice President for Research and Development, NSYSU. The MOUs provide an umbrella for increased collaboration attributing the following benefits reaped today. Several research projects on authenticating unique medicinal plants in Sri Lanka, have already been initiated under the supervision of Prof. Ranil de Silva at the USJP. Dr. Anchala Kuruppu is a research fellow who is undertaking research on natural products, at the USJP under the supervision of Prof. Priyani Paranagama and Dr. Prasanna Galhena of the Kelaniya University. Dr. Kuruppu conducts her research on a variety of Sri Lankan endemic plants, and she has found medicinal benefits in several plants for various diseases such as cancer. According to Dr. Kuruppu, determining the mechanism of action of active compounds isolated from these plants will help in personalised medicine which could be combined with the pharmaceutical industry. 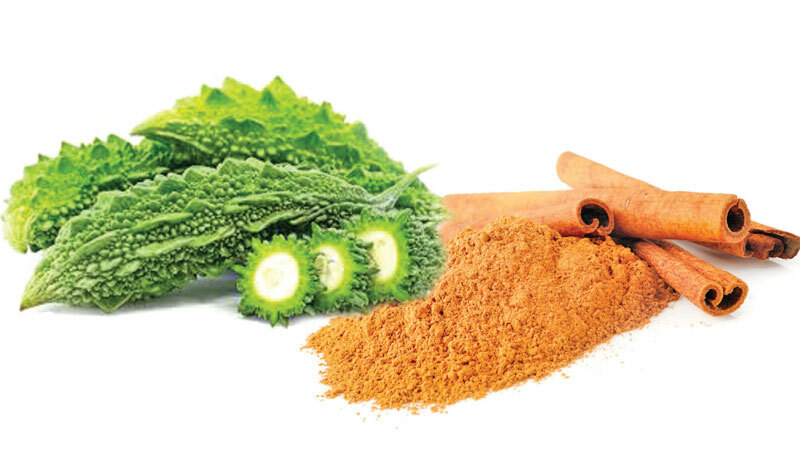 Research Assistant Maneesha Madhumali has already detected antioxidant properties, antityrosinase properties and anti-obesity properties in a number of cinnamon varieties. Under Prof. Paranagama of the Kelaniya University, Research Assistant Gayathri Amarakoon started authentication of medicinal plants with the barcoding of Cinnamomum zeylanicum under the supervision of NSYSU Biological science Department Chairman Prof. Yu Chang Chiang. As a consequence of the two MoUs between the NSYSU and USJP, the Marine and Biological Sciences center and the Environmental Change Sciences and Technology Innovation Center (ECSTIC) have been established at the Zoology Department of the Applied Science Faculty of the USJP, implementing international split-joint collaborative research projects on both marine biology and natural product genetic characterisation through student exchange programmes. 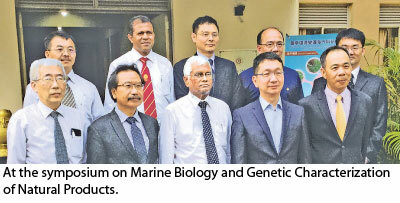 Moreover, the inauguration ceremony was followed by a symposium on Marine Biology and Genetic Characterisation of Natural Products, hosted by the World Class University Project (WCUP) in collaboration with the NSYSU. The symposium was organised to bridge the gap between industry and academia, focusing on product development and genetic characterisation of natural products to address the pressing need to protect our endangered species, and the establishment of a plant genetic library under the guidance of Prof. Yu. Prof. Yu’s expertise in numerous fields such as plant genetics, population genetics, molecular evolution, phytogeography and conservation genetics would be a great asset to fight the adulteration of natural products in Sri Lanka. The ability to differentiate products is essential for the maintenance of consistency which is required for producers to maintain a favourable reputation among consumers. A good reputation will reflect a boost in profits gained through international trade in sectors including pharmaceuticals, agriculture, nutraceuticals, toiletries and cosmetics. Investing in genetic fingerprinting will have a positive impact on the economy of the region, as it will attract more customers because of the transparency that it can provide to potential investors. With an intriguing threat for biopiracy and bioprospecting in the nation, the government should commence legal action to preserve the wealth of our natural products. Therefore, biopiracy should be placed high on the legislative agenda for this year. 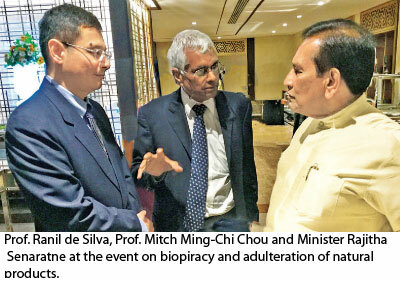 A meeting was held between Health, Nutrition and Indigenous Medicine Minister Dr. Rajitha Senaratne, Prof. Yu and Prof. Ranil de Silva to discuss on the implementations to battle against biopiracy and adulteration of natural products in Sri Lanka. The event has undoubtedly strengthened the bond between the two institutes and it has laid a basis for even closer, more cooperative relations in the future.